The Walking Dead S9.10 review: "Trite, frustrating, and manufactured"
You were this close AMC. Six episodes away from a full, stinker-free season of The Walking Dead, but episode 10 - Omega - has gone and spoiled the batch (warning: spoilers for The Walking Dead season 9 will be discussed beyond this point). It starts off promisingly enough, with a flashback to the early days of the apocalypse showing Lydia and her parents (including her mother, AKA Whisperer leader Alpha) hiding out in a barricaded building. It turns out, however, that we’re not being treated to a full, Walking Dead prequel episode. Instead, the scene is all playing out in Lydia’s head, as she’s seen reminiscing to Henry while the pair are locked away in Hilltop’s cells, with the whole episode revolving almost entirely around her character’s past and present life, clumsily bouncing between the two timelines with little finesse or forethought. I’m all for The Walking Dead using flashbacks to characterise its survivors and fill in their backstories with fresh revelations (I actually think the show doesn’t use them nearly enough), but this particular journey to the past is executed horribly, awkwardly conjuring up Lydia’s memories whenever the person she’s talking to triggers another recollection. The only way it could have been more cliched is if the character began every flashback with “It all started when…” while a harp plays in the background and one scene ripples into the next. The flashbacks are also a detriment to the larger story at play in The Walking Dead season 9. What made The Whisperers so scary up till now is that we don’t know who they are, what they’re capable of, or even why they do what they do. As Henry himself rightly points out, “walking around in dead people’s skins is pretty messed up”, but Lydia’s story tells us everything we need to know about Alpha and her culture of clandestine warfare, deconstructing the myth and revealing the woman behind the wizard’s curtain. This wouldn’t be a problem if it was the end of the season, or even the beginning of the next. But it’s not. We’ve literally just met The Whisperers, and we now already know almost everything about them. Worse still, Alpha’s evolution from midwestern housewife to draconian killer comes out of nowhere, mainly because the scattershot nature of the flashbacks doesn’t give actress Samantha Morton enough time to make that transition seem believable. An entire episode devoted to Alpha’s backstory later in the season would have been a better approach, but the fact of the matter is, I’m not scared of her anymore, and we’ve barely met her! And it’s all thanks to these stupid, stupid flashbacks. It’s not as if the present day scenes shared between Lydia, Henry, and Daryl fare any better either. While it’s nice to see Daryl take on the gruff but wise mentorship role to Henry that normally would be reserved for a character like Rick, even Norman Reedus can’t save Omega from its slow motion nosedive. For one thing, the trio barely leave the cell block, which keeps the episode looking as bland as it feels, and it turns out that grown up Henry is just as annoying and stupid as his younger self. He continues to speak in matter of fact monosyllables like a weird, creepy child (“I like you”, “I’m glad you and my mom are friends”, “I just ate a worm”) and is still, seven years on from when he nearly got everyone at Hilltop killed, putting the entire community at risk when he decides to let Lydia out of her cell for the night. Thankfully no one dies this time around, but I won’t lie; I was kind of hoping for Lydia to save us the trouble and whack him round the head with that hammer while she had the chance. "Even Norman Reedus can’t save Omega from its slow motion nosedive"
Outside of the flashback scenes, we also see our new group of survivors (Magna, Yumiko, Connie, and Kelly) go out to search for Luke and Alden, before coming back and going out again, only to finish the episode by, yep, returning to Hilltop having achieved absolutely nothing. It’s about as uneventful a series of events as they come, furthering absolutely nothing in the plot aside from re-emphasising just how cliquely this quintet of newcomers are, barely integrating with the larger cast of characters outside the odd one-to-one conversation. At least there’s one moment of brief humour, as Tara tries to figure out whether a herd of Walkers are undead or humans in disguise (“Funky walk? Check. No Weapons? Check”), but that’s about it. Omega is easily the weakest episode of season 9 so far, feeling about as trite, frustrating, and manufactured as The Walking Dead can get, not to mention completely undermining any sense of danger or intrigue we had about The Whisperers. Episode 10 seems to imply that we’ll be getting more flashbacks to Lydia’s past throughout the rest of the season, but I can only hope that AMC steps up its game and learns how to use them to enrich the show’s continuing story, rather than devaluing it. 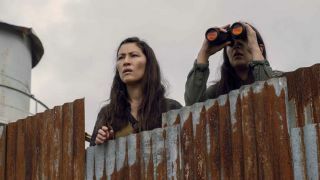 Verdict: The first real misstep in an otherwise solid season, Omega is hopefully the exception to the rule in this new era of The Walking Dead.